– ►​ YOUR CHILD DESERVES A MORE PRODUCTIVE ACTIVITY than video games, phones and tablets. STEM supported Engineering Blocks are built to develop your child’s Science, Technology, Engineering and Math skills. Challenge your kids to build ​creative designs, trucks, ​transformers​, helicopters, robots and much more! For​ boys and ​girls age ​3 through​ 6+ years​,​ designed to support your child’s creativity as they grow. – ►​ GIFT A TOY THAT IS FUN AND EDUCATIONAL. We believe in making ​toys that are both fun and educational. This 101-piece ​gift idea ​set will help kids build fine motor skills, hand-eye coordination and enhance creativity while keeping them entertained for hours! Which means more time for mom and dad! Supports logical thinking and problem solving, unleashing your child’s imagination to endless possibilities. – ►​ HELP YOUR CHILD BUILD SOCIAL SKILLS AT AN EARLY AGE​. Social development, teamwork and collaboration are critical to success in today’s world. 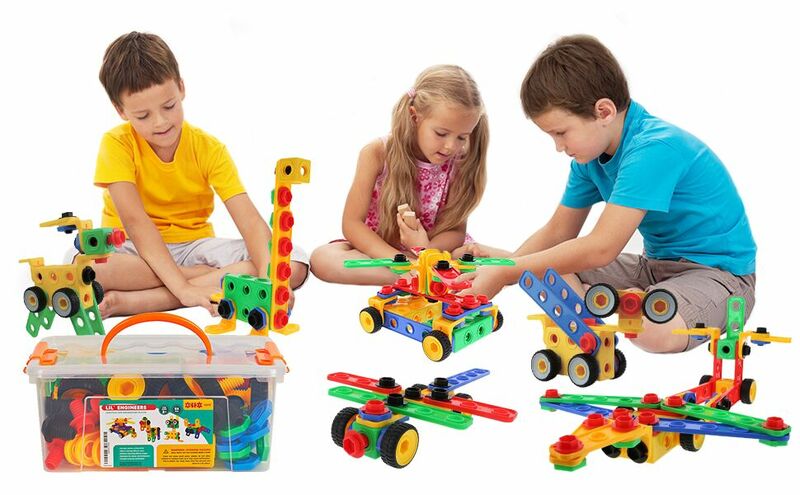 ETI Toys Engineering blocks are designed to develop your child’s social skills from an early age. Encourages children to work together as a team to build awesome creations and comes with two dual-purpose ‘clicking’ wrenches to help support interactive play. – ►​ BONUS STEP BY STEP EBOOK WITH 12 FUN TOY DESIGNS​! Toys should offer quick and hassle-free cleanup for both parents and kids. That’s why our STEM Engineering blocks are washable (to keep germs at bay) and come with their own easy to carry storage tub. ​Each set also includes an exclusive 80 page step-by-step instructional eBook with 12 different ​toy designs for Easy, Intermediate, and Advanced levels. – ►​ YOUR CHILD’S SAFETY IS PARAMOUNT TO US. All ETI Toys products are exhaustively and Independently Third-Party Lab Tested. 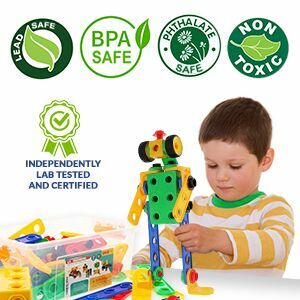 Certified Non-Toxic our Engineering​ Learning Set​ is BPA-Safe, Lead-Safe and Phthalates-Safe. They also come with a 100% Money Back Guarantee. ETI Toys is the Original Seller, so please beware of imitation knockoffs. Your child’s safety may not be as important to counterfeit sellers. ETI Toys is here for all your toys!! If you want your kids to enjoy educational toys that progress learning, versatile to different age groups, promote collobartion with other kids then look no further!! What’s best is as a parent or grand-parent, you can have a peace of mind that your little ones are playing with safe toys, free from toxins! What more is that our toys are simply fun! Kids love them and play with them for hours! And we’ve seen adults building some cool designs with their kids too! So why wait! Give it a try! ETI Toys is here for you! it’s WIN WIN for you and your child! 101-Piece Set Brought To You By ETI Toys! ETI Toys Engineering Blocks is a premium quality set of 101 building pieces! Here are a few features to explain why ETI Toys construction engineering building blocks is for both you and your child! 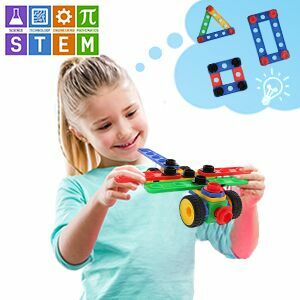 STEM supported toy that promotes learing in Science, Technology, Engineering and Mathematics. Safety is paramount to us so our toy is unquestionably safe! Comes in a carryable box with 101 pieces to make all sorts of fun toys. 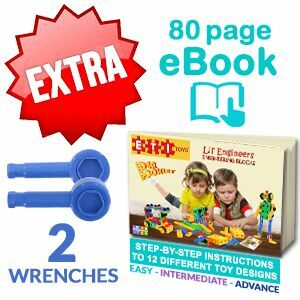 An extra wrench for kids to play together and and eBook with 12 great designs like a dog and an airplane! Perfect For Any Child Of 3 To 6+ Years Old! 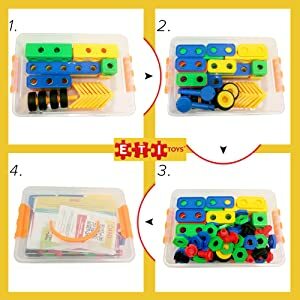 ETI Toys 101 Piece Engineering Blocks Set grows with your child! 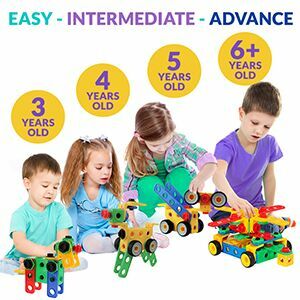 So why not have your child discover and learn through years of exploring this fundamental toy, while also building logical thinking and problem solving techniques as they use our premium building pieces to build airplanes and trains and oh! animal figures — imagination is limitless. You know what worries us as parents? Safety for our kids. We worry about it so you can be at peace! Our Engineering Blocks are certified, non-toxic product, safe from BPA, lead and phthalates! Hey! We at ETI Toys have our own children play with them. STEM Learning Can Be Fun! Imagine your child excelling in school! We have designed Engineering Building Blocks to encourage STEM learing. No more watching boring videos! Let’s build stuff and learn! We have not one but two extras included! An 80+ page eBook with some of the coolest designs and an extra wrench. Use our eBook to build some cool design and an extra wrench to build them with kid together! Intelligent Design! Why we designed our bin the way we did! When it comes to our toys, we put thought into designing everything, even the packaging. Here, we have designed our storage bin with deliberate intention to help teach children how to organize better. It’s one of the life key skills. See how even storing away toys can be fun! After all, who wants bulky boxes and scattered toys in their home, when you can have neatly organized and easy to carry bins. Amazing manipulative toy! My daughter (almost 3) loves building things, working with tools, etc. I was searching for a toy that would let her really use her hands and coordination to build things and that at 2 years old she could handle. This was the toy I was looking for! She loves to build different cars, planes, animals, etc. She loves the little screwdriver/wrench tool that came with it. She can build a lot of things by herself, which makes her very proud. The only negative is that you can usually build one item (from the page with pictures on it) and if you want to build another one you have to take apart what you just made. Also, its a random assortment of parts, so some of the building items show you using 6 wheels, and my box only came with 4, but we make it work.She loves this toy so much I think I’m going to order it again so she can make multiple things at a time! After a week of play I changed my rating from 3 to 1 star.I regret not buying two sets of M&D wood sets instead for a two-thirds of the price of this set… Yes, this is educational and engaging (easy for a 5 year old for independent play, can be done collaboratively with a 3 year old if he/she has a very good attention span) but these pros are outweighed by the cons:- Horrible wheel design. The wheels are like screws themselves, so if you build a car and roll it, the wheels unscrew themselves and fall out within seconds. VERY frustrating and disappointment for a child who wants to show off his/her creation or play with the toy they have built.- The tension is not great. There is a fine line between too much tension (so it is hard for a kid to unscrew) and not enough tension such that pieces get loose and undo themselves – which is the case here. Again, very non-gratifying play experience.- It is not possible to build some of the models well because the bolts are too long and interfere with each other when screwed into the cube or the “plate” sections.At first, my kids first were super excited and engaged, but because of these reasons, they soon got annoyed and frustrated and would not like to play with this construction set. It ended up being a colossal waste of money given that this set is priced like a quality product…I like that (unlike M&D) this set includes two large rectangular “plates”, and I liked the “brackets”. But other than that, there is absolutely no advantage to this over M&D wooden sets (priced $14 on Amazon, you can get 2 of them for two-thirds of one ETI and have approximately the same range of building options, plus enjoy natural materials). Plus, M&D offer different lengths screws and a screwdriver that actually makes sense (as opposed to the odd “thingy” — as my child called this tool — included with the ETI set). We got this for our 3year old for his birthday. He already had a few “take apart” trucks that have the screws and screwdrivers, and loves them so we thought we’d give this a try. It’s a great product, comes with lots of parts and pictures of things you can make. He always asks one of us to build with him. He is slowing understanding how to make something in his own (we’ve had it about a month) but really looks for help when he wants somthing really specific (which is most of the time). As a parent playing with a young childs toy, I really enjoy it too! It’s one of the few toys he has, that when he asks me to play, I don’t internally groan! I’m only giving it 4 stars for two reasons… 1) the tote it comes in is small and you have to arrange the pieces just so if you are putting them all away. A larger tote so you can just dump them in there would be great. 2) would be better with more wheels and block pieces. You really can only make 1 1/2 vehicles out of it (and that’s my sons favorite thing to make). And for the price I think the set could be a little bigger.Over all we are very happy with this purchase and recommend it for anyone who has a young child who likes to build or likes to take things apart to see how they work.